Fundraising and facilities are a huge part of evaluating him. You also have to consider branding and what may or may not happen from a gear availability standpoint (if Athletics can get the authority to have their own presence) and logo refresh/redesign. I agree those are important parts of his job. But how hard (or impossible) is it to brand/fundraise/get new facilities when you’ve been in the rut we are. That’s why you’re not going to know how he is as an AD till we know how his hires work out. Even Judy was well received as an AD when she was winning. Some of that for athletics has already been used, but from the Exponential campaign they should have a good pool of resources to start from. He also has to be able to sell the vision to new high profile donors to help raise the resources needed as well. How much of the athletic #'s were already given/pledged by big cat, etc? I do believe it includes $$$ from Richardson and the promenade donation. 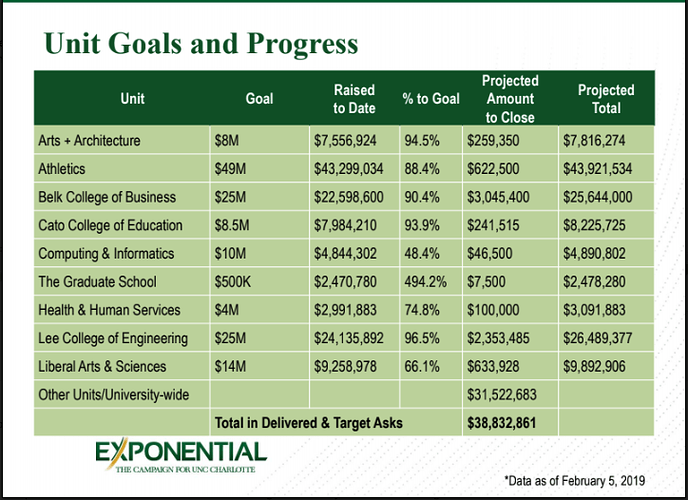 clt says we have the largest computing school in the state, what is happening with fundraising? That graph pretty much tells you the relative values of the degrees from each department. Those who’s graduates make more, give more. I think the outlier here is CCI. I would think those graduates are making quite a bit but typically have personalities where school is a means to an end and they have no connection after graduating. Isn’t that pretty much 90% of our grads? See attendance/name change. I’d also be interested in seeing the breakdown of percentage of total alums from each college and the average age of those alums. I’d assume Belk would have one of the larger percentages and one of the older populations. I give Hill an A on low hanging fruit. There was so much that needed to be done that was easy to either do or get started doing. He has executed against nearly every one of those on my book. His admin has been a 180 from Judy’s in many regards and that is exact what we needed. I would have liked to see some turnover in the admin level, but I think he is giving everyone a chance to show what they bring to the table. I cant state often enough the cuffs Judy put on people, we had more talent than we were using and Hill is giving them a chance. That is a fair move in my book. The coaching hires are what they are. He swung big for Houston and handled it the right way. I assume Brad knew going into the season a bowl appearance was the bare minimum and I am sure Hill handled that with class. The hire was out of the box, but from all signs well received nationally. Sanchez makes total sense on paper. #1 ast from #1 team in nation. No HC experience but much better pedigree than last two. Time will tell, but hiring coaches is an art not a science and both of the hires look like solid additions. Sanchez’s resume is way stronger than the last two hires and Tom Cruise looks to be just what we needed in football. Fixing some recruiting issues will pay massive dividends. Other sports , gotta fix these two first. The facilities report will be a great read on direction and the fact Hill came in and immediately said we will raise 9 million more in exponential I think is a sign he isn’t scared of failure or about setting a goal - the same thing can not be said of previous leader. So A on low hanging fruit incomplete on the rest.